Your dog is lapping up water from his bowl in ever-increasing amounts, and then scratching at the backdoor to go out much more often than usual. At the same time, he's not scrambling to his food dish and agitating for dinner like he used to. Increased thirst coinciding with increased urine production, as well as a decrease in appetite, may be signs of kidney disease. While dogs with kidney disease can't be cured, their lives can be prolonged by carefully managing their diet. Just as in humans, kidneys do much more than produce urine. They remove waste products from the blood and help regulate potassium, sodium, and other nutrients as they conserve water. When one of these functions is compromised, your dog may be diagnosed with kidney disease. While the term "kidney failure" may sound like the kidneys have completely shut down, the picture isn't quite so dire. Chronic kidney failure, also called chronic renal failure, means that a dog isn't filtering waste products as he should but can still urinate without a problem. Advancing age is one risk factor for kidney disease, and some breeds, including English cocker spaniels, bull terriers, Dalmatians, Newfoundlands, Samoyeds, and German shepherds, may be more susceptible to developing kidney problems. Kidney disease can be hard to detect by pet owners initially. By the time your dog exhibits symptoms of kidney failure, the kidneys may only be functioning at one-quarter to one-third of normal levels. As damage to the kidneys progresses, dogs often get dehydrated, which leads them to drink copious amounts of water as their kidneys send increased blood flow to the kidneys in an attempt to filter waste products. Even if your dog is asking to go out more frequently or having accidents, it's important to let her drink as much as she needs. Dogs with kidney disease may also be lethargic and eat less than they used to. Their reduced appetite may lead to weight loss, and they may vomit frequently. They may also have bad breath, ulcers in the mouth, and their noses and gums may appear paler. Glomerular disease. The glomeruli are microscopic filtration units in the kidneys. The millions of glomeruli can become damaged, causing them to lose function. This can lead to inflammation, scarring, and elevated blood pressure in the blood flow to the kidneys. Pyelonephritis. This kidney infection leads to a reduction of function. Kidney stones. Officially called nephrolithiasis, kidney stones can not only damage the kidneys but block the urethra. Amyloidosis. In this rare condition, abnormal deposits of protein are made in the kidneys. The problem can be inherited in some breeds, including Shar Peis, beagles, collies, and Walker hounds. Leptospirosis. This infectious disease is caused by bacteria found in soil or water. Your dog could come in contact with it while splashing through a creek or digging in the yard. While some dogs have a mild case and recover, leptospirosis can lead to kidney failure. When your vet suspects kidney failure may be the cause of your dog's ills, she will first do a physical exam. One sign she will look for is dehydration, which can be checked for by gently pinching fur and skin between your fingers. It should snap right back into place if your dog is well-hydrated. If he is dehydrated, the skin will more slowly settle back into place. The vet will also do a complete urinalysis and blood biochemistry analysis in dogs with kidney disease. Testing the urine can help give a picture of how the kidneys are functioning. The earliest indication of kidney failure is low specific gravity in the urine. This measure indicates the concentration of minerals excreted through the kidneys. As the kidneys filter fewer toxins out of the urine, the specific gravity falls. Low specific gravity indicates that about two-thirds of the kidney function has been compromised. The most important blood test in diagnosing chronic kidney failure measures two waste products found in the blood: blood urea nitrogen (BUN) and creatinine (CREA); if the kidneys aren't excreting these well enough, these numbers will go up. Giving your dog extra fluids and electrolytes under the skin, called subcutaneous hydration, can help flush toxins out and keep him hydrated. The procedure is usually done several times a week, either at your vet's office or at home. A needle is inserted between your dog's shoulder blades, where there are few nerve cells, and fluids from an IV bag drip beneath the skin and are absorbed by the body. Dogs with kidney failure often feel much better after the treatment and may eat more and be less lethargic. Nutrition is a primary component in managing your dog's kidney failure. Overall, dogs need less protein, phosphorous, and sodium but should increase their intake of omega-3 fatty acids. This diet will help reduce the toxins that the kidneys normally flush out, as well as minimize issues with fluid and mineral balance. 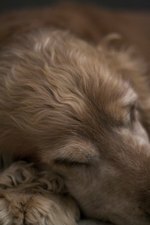 While a dog kidney failure diet can't reverse the damage already done or cure your pet, it can both prolong her life and help her feel better. Feeding three to four small meals a day rather than one or two larger ones can help spread out the amount of waste material kidneys filter throughout the day. An important component of treating chronic kidney failure is ensuring adequate hydration. Dogs with a kidney disease should be given an unlimited supply of water. Feeding canned food rather than dry can also help increase fluid intake. Decreasing the amount of protein in your dog's food can help lower the work the kidneys must do to break down waste products from the protein and excrete them. Eggs and meat are the most common protein sources in dog foods. As protein is broken down, waste products related to nitrogen are released. These include urea, uric acid, creatinine, and hippuric acid, with urea being the most common. Less need for filtration helps preserve kidney function. In a dog with kidney disease diet, look for foods that are 14 to 20 percent protein by dry weight. Dogs without special dietary restrictions need food that is 18 to 25 percent protein. While vets don't know the exact reason, lowering the amount of phosphorous in the diet can also slow the progression of kidney disease. The amount of protein in food is linked with the amount of phosphorous so that when protein is lowered in the diet, so is phosphorous. Bones, egg yolks, dairy products, and organ meats have high phosphorous content, and while your dog can consume these, the amount should be limited. Dogs with chronic kidney failure should eat food that is 0.2 to 0.5 percent phosphorous. They should consume no more than 7 to 18 mg of phosphorus per pound of weight each day to maintain a low phosphorous diet. Some vets also recommend lowering sodium levels since 60 percent or more of dogs with kidney failure also have high blood pressure. And high blood pressure can further decrease kidney function. Reducing sodium can reduce blood pressure. Most dogs with chronic kidney failure will lose weight as the disease progresses and their appetites decrease. That means feeding your dog high-calorie, nutrient-dense food can help him maintain weight. One way to do this is to gradually increase the amount of fat in your dog's diet. Little phosphorous is found in fats. Fatty meats like lamb and pork are one choice, as are whole milk products. A little bacon fat may revive your dog's interest in food and add extra calories. The omega-3 fatty acids in fish oil may slow the progression of kidney disease, and supplements can be a helpful addition to dogs with a kidney disease diet. Liquid fish oil capsules can be given. The EPA (eicosapentaenoic acid) and DHA (docosahexaenoic acid) in fish oil can help reduce inflammation as well as creatinine while reducing pressure on the kidneys. There are a number of dog foods you can buy that take the guesswork out of trying to balance protein, phosphorous, sodium, and fat needs in dog kidney failure food. However, they can be much more expensive than typical commercial foods for healthy dogs and require a prescription from your vet. Hill's Prescription Diet k/d Kidney Care is available in a variety of flavors, including chicken and vegetable stew, beef and vegetable stew, and lamb. In addition to the foods being low in phosphorous and sodium, they contain l-carnitine and omega-3 fatty acids to boost kidney health. Purina Pro Plan Veterinary Diets NF Kidney Function Formula adds B-complex vitamins, which help to protect the body and break down nutrients. Royal Canin Veterinary Diet Renal Support D is formulated to be aromatic to entice dogs with a poor appetite to eat more. Blue Buffalo Natural Veterinary Diet KS Kidney Support is grain-free, and its first ingredient is chicken. Hill's Prescription Diet k/d Kidney Care has chicken and lamb flavors. Royal Canin Veterinary Diet Renal Support D has three formulas, A, F, and S, with the A formula being lowest in protein. Purina Pro Plan Veterinary Diets NF Kidney Function Formula features corn, brewers yeast, and dried egg. Blue Buffalo Natural Veterinary Diet KS Kidney Support includes chicken, peas, and potatoes. One way to control what ingredients your dog ingests is to make her food yourself. This takes some commitment, as you will need to both shop for ingredients and then prepare the food, rather than simply opening a can or pouring dry food into the bowl. The following suggested recipes can help ensure low protein and low phosphorus foods for dogs. One sample diet for a 40-pound dog calls for 6 ounces of meat (such as chicken or beef), 6 ounces of grains and vegetables (like potatoes and beets), one large egg plus an egg white, and an ounce of liver or kidney meat per day, divided into two meals. A teaspoon of ground eggshell should be added to each meal to add calcium and bind phosphorous. Fish oil (not cod liver oil) can be added. A recipe for chicken and potato dog food that is low in protein, phosphorous, and sodium, but high in potassium calls for 1/4 cooked chicken breast, 3 cups of potatoes boiled in the skin, 2 tablespoons of chicken fat, 1 1/2 calcium carbonate tablets, and 1/2 multiple vitamin and 1/2 mineral tablet. The recipe is appropriate for a 21- to 22-pound dog and provides 689 calories, 18.9 g protein, 26.8 g fat, as well as 45 percent of phosphorus, 54 percent of sodium, and 301 percent of potassium daily requirement for a healthy dog.